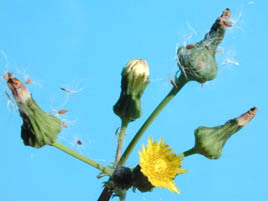 Annual Sowthistle (Sonchus oleraceus) is a dicot weed in the Asteraceae family. In Victoria this weed first evolved resistance to Group B/2 herbicides in 2010 and infests Spring Barley, and Wheat. Group B/2 herbicides are known as ALS inhibitors (Inhibition of acetolactate synthase ALS (acetohydroxyacid synthase AHAS)). Research has shown that these particular biotypes are resistant to chlorsulfuron and they may be cross-resistant to other Group B/2 herbicides. Greenhouse, and Laboratory trials comparing a known susceptible Annual Sowthistle biotype with this Annual Sowthistle biotype have been used to confirm resistance. For further information on the tests conducted please contact the local weed scientists that provided this information. There is no record of differences in fitness or competitiveness of these resistant biotypes when compared to that of normal susceptible biotypes. If you have any information pertaining to the fitness of Group B/2 resistant Annual Sowthistle from Victoria please update the database. Werth, J. ; Walker, S. ; Thornby, D. ; Boucher, L.. 2012. Decade of glyphosate-resistant cotton in Australia: what has changed?. Pakistan Journal of Weed Science Research 18 : 671 - 676. Glyphosate-resistant cotton has been widely adopted in the Australian cotton industry since 2000. Weed management practices are now heavily reliant on glyphosate. Even before the introduction of glyphosate-resistant cotton varieties, glyphosate was increasingly being used. To evaluate any relevant weed issues resulting from this reliance upon glyphosate, we re-surveyed 50 fields previously surveyed in 2001. Results showed a species shift, with Conyza bonariensis and Sonchus oleraceus dominating the flora in cotton systems in 2010-2011. Other glyphosate tolerant species, such as Convolvulus sp., also increased in certain fields. Hibiscus trionum, Ipomea lonchophylla and Echinochloa colona were common in the majority of fields. In 2009, this survey resulted in identification of the first glyphosate resistant weed in Australian cotton systems, E. colona. This population exhibits 3-4 fold resistance to glyphosate. The presence of a glyphosate resistant grass has the potential to increase weed control costs in crop by $40 to $90/ha/yr as well as increasing fallow costs by up to $70/ha/yr. Research was undertaken to determine options for control of C. bonariensis and E. colona in cotton systems, using herbicide alternatives to glyphosate. This paper describes weed management challenges for the Australian cotton industry and explores chemical management options for glyphosate tolerant and resistant weeds..
Werth, J. ; Walker, S. ; Thornby, D. ; Boucher, L.. 2011. A decade of glyphosate-resistant cotton in Australia: what has changed?. : 571 - 575.